Moving Art: What are the Global Unity Games? What are you most looking forward to for this year’s games? Jon Ramer: We organize five Compassion Games throughout the year; we call each of them a “coopetition” and each one has a theme. You keep score by counting the number of volunteers, hours of service, the number of people served, and the monies raised to support local causes, which can be tracked on our website. From September 11 through September 21, the International Day of Peace, we organize the Global Unity Games. This year is the 15th anniversary of 9/11 and we are a part of launching a five-year campaign we call “Tomorrow Together.” The goal is to bring young people together to learn about each other and do good deeds in a global expression of hope for a better tomorrow. We organize the Giving Games from 11/29 – 12/9. The MLK Weekend from 1/13 – 1/16. The World Interfaith Harmony Week from 2/1 – 2/8. Love this Place! Serve the Earth Week 4/15 – 4/23. MA: How can we join the games? Can we support the games even if we’re not playing? Jon: Individuals can sign up to play on our website and become “Agents of Compassion.” Individuals can also register teams that participate in the Games. You can play by doing a random act of kindness, organizing a service project, or anything in between. MA: How did the Compassion Games start? That birthed the Compassion Games: Survival of the Kindest. Now over 375 communities around the world that have started similar campaigns. In the process we came to understand that compassionate cities are “uncomfortable cities.” The challenges faced by cities include housing and homelessness, economic development, infrastructure, social isolation and disconnection, public safety, education, and institutional failure. The vision of a compassionate city cannot ignore the resignation, hopelessness, and despair that so many people feel. For a community to engage we would have to find a way to inspire people to get involved, to get off the sidelines and onto the playing field if you will. We want to move people out of their comfort zone and into their stretch zone (not into their panic zone)! We realized the Compassion Games could be a great way to boost and ignite a community’s ability to create healthy, vibrant, thriving places of opportunity and compassion. Jon: We define compassion as “empathy into action.” What we love about compassion is that it doesn’t belong to any particular ideology, philosophy, belief system, or religion. Everyone knows what it is to be compassionate; the games are a way to unleash that spirit. MA: You call the Compassion games a “coopetition.” What does that mean? Jon: In a coopetition you are “cooperating to compete.” Not against each other, but with each other. The root of the word competition is “competere,” which means to strive together. We are looking to reframe our understanding of competition. 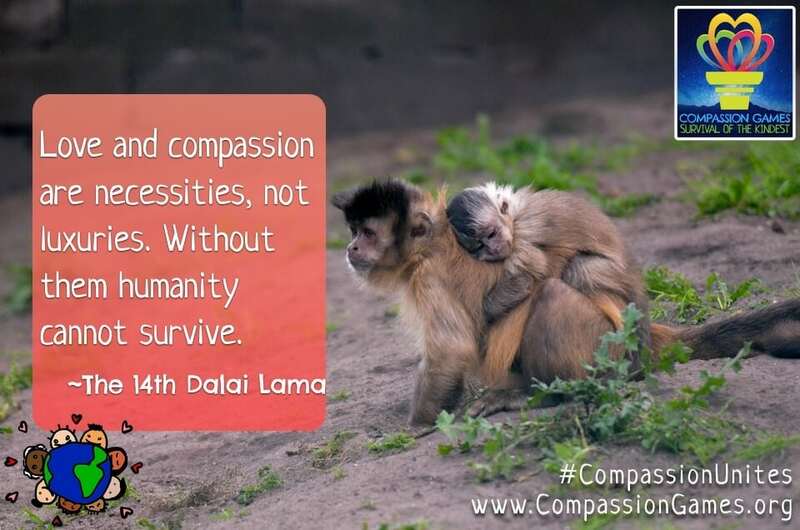 MA: Why is the Compassion Games’ motto “Survival of the Kindest”? MA: Can you share one or two of your favorite stories to come out of past Compassion Games? Jon: A woman’s prison in California has participated in the Compassion Games for three years in a row. A woman there known as “evil” changed her name to “Tinker Bell” and has continued to use that name since they first participated in the games, during which they went 11 days without a single incident of violence. Another story has to do with prostitutes and nuns who teamed up to clean up the streets in Spain! There are many examples of remarkable acts of kindness and caring that were done by people all over the world. MA: What is your hope for the future of the Compassion Games? Jon: Not unlike the Olympic Games movement that celebrates our physical strength and ability, I’d love to see a Compassion Games movement that recognizes and celebrates our social and emotional abilities. Want to spread compassion in your community and not sure where to start? The Compassion Games website has everything you need to know, plus stories that can give you ideas on how to join in this year’s coopetition. If you miss out on this year’s Global Unity Games, don’t fret – check out the other themed games and gather your team for your own Survival of the Kindest!